Upon completing Level 1, I began teaching karma yoga classes at an elementary school for my YogaFit community service hours. I am a deaf educator at the school, and saw a need to bring yoga to my workplace. The participants are my fellow teachers and school staff members-- mostly women in their 20’s-50’s. We meet for 45-60 minutes after school on Tuesdays and Thursdays. The reason I chose to teach yoga at our school was to fill the void of a yoga class that once existed. When I first started working at the school there was an occupational therapist who taught Tuesday afternoon yoga classes for faculty and staff. However, she retired over a year ago, leaving our faculty and staff with no opportunity to practice yoga at school for the 2016-2017 school year. 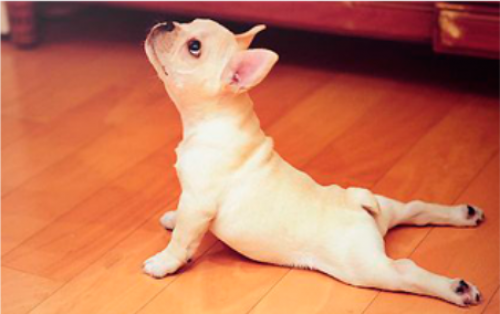 It was my mission to not let another school year slip by without a yoga class being offered. Once that class dissolved, two of her regular participants were disappointed that they no longer had a way to practice yoga. Most of my yoga class participants have young children who attend daycare. This makes it very difficult for the participants to work full-time, and then go to a gym/studio for a yoga class and pick their children up at daycare before it closes for the evening. Therefore, I loved the idea of bringing yoga to my coworkers! By setting up a yoga class at our school, I can give my co-workers the option to attend a yoga class at their own workplace. Many people have told me “I love yoga!” or “I’ve always wanted to try it!” but many didn’t have an opportunity to participate in a regular class. 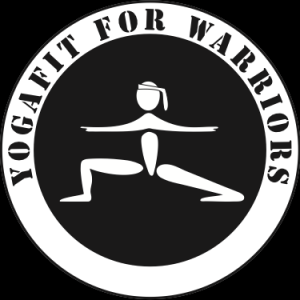 By teaching at the school, I have been able to expose yoga to first-timers, as well as facilitate growth for yogis who previously enjoyed a yoga practice. One of my favorite experiences while teaching my karma yoga classes has been watching a regular attendee’s self-confidence soar. For two years. she went to a local gym. However, she discontinued working out there after she developed an issue with a tendon in her foot. She ended up in a boot for 4 weeks, and was pretty unhappy about the whole situation. 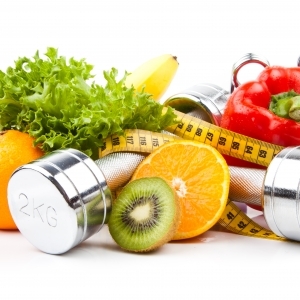 She was looking for an exercise program that would increase her health and strength, without causing more injuries. When this woman heard I was offering yoga classes, she said she wanted to try it. She didn’t come for the first month or so, even though she kept saying she was interested. Eventually she came, and now she comes to almost every one of my classes. She has purchased her own mat, and has had fun shopping for new yoga clothes and workout wear. At first, I could tell she viewed coming to yoga as coming to my class; now she views it as her yoga class. She has really owned the practice for herself. She has encouraged more coworkers to come try yoga; she regularly says “Yoga is so good for you! You never hear anyone say ‘Oh gee, I really need to do less yoga to improve my health.’” It has been a delight for me to watch her practice blossom over these past few months. Thank you YogaFit, for pushing me beyond my comfort zone to bring yoga to participants who have really enjoyed and benefited from my teaching practice. I look forward to teaching for many, many years to come. 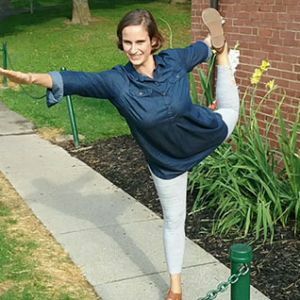 Kati Phillippe originally began her yoga practice as a "last resort" treatment option when she was diagnosed with degenerative disc disease in 2012. 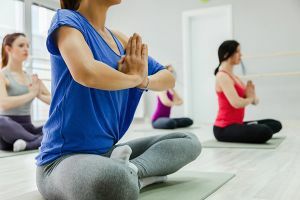 Numerous physicians repeatedly recommended physical therapy and yoga to help strengthen the core; Kati struggled with the idea that "a few exercises" would help ease her pain. While a senior at the University of Tennessee, Knoxville, she began attending weekly yoga classes at the UT Rec Center. What started as an exotelic yoga practice slowly became an enjoyable weekly hobby. When Kati completed her Master's Degree in Deaf Education, she moved to Birmingham, Alabama. She quickly got involved with the Birmingham YMCA, and occasionally attended yoga and Pilates classes. Over the years Kati's practice of yoga grew beyond a hobby and became a passion. 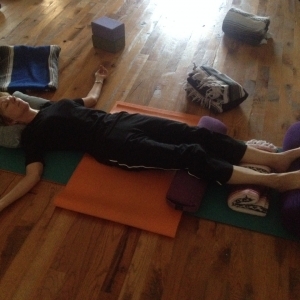 She has learned much about her own body thanks to her yoga practice, as well as many years of physical therapy. Her greatest wish is to bring the gift of yoga to all who wish to embetter their physical and mental well-being. Kati is just beginning her journey as a yoga instructor, but hopes to become RYT-200 certified through YogaFit in the near future. She currently teaches bi-weekly classes for fellow faculty and staff members at the elementary school where she works as a deaf educator. Kati is fascinated with neurolinguistics, and how positive language can physiologically affect the whole body in a powerful way.